Maria Giuseppina Bertone first appears in the Painesville, Ohio, area in 1935. 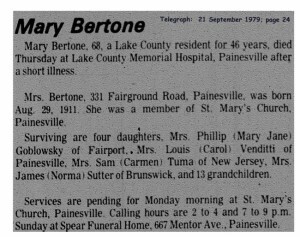 In America, Maria was known by her married name Mary Bertone. Her maiden name and place of birth are not known. Maria Giuseppina Bertone was born on August 29, 1911, at Italy. She married Mattia Bertone. Maria Giuseppina died on September 20, 1979, at Lake County Memorial Hospital, Painesville, Lake County, Ohio, at age 68. Her body was interred at Riverside Cemetery at Painesville, Lake County, Ohio. Maria Giuseppina Bertone immigrated to the United States on November 14, 1935, at age 24. She lived at 353 North St. Clair Street, Painesville, Lake County, Ohio, on January 12, 1937. Maria Giuseppina Bertone became a citizen of the United States on August 24, 1944. Maria resided at 273 Sanford Street, Painesville, Lake County, Ohio, when she was naturalized. At the time of death, Maria resided at 331 Fairgrounds Road, Painesville, Lake County, Ohio.